Geoffrey Kostecki excels at the sacred art known as liturgical painting. As a young man, he was inspired by the powerful imagery of Catholicism, first created for the Church during the Renaissance. Kostecki moved to Italy to study at University Lorenzo Di Medici in Florence. There he gained many of the advanced painting techniques required for liturgical painting which includes site-specific design, fresco painting, figurative sculpting, stencil design, gilding, and marbleizing. After returning home and earning an MFA, Kostecki apprenticed himself under figurative painter Graydon Parrish, who himself had trained through the Atelier method, and with trompe-l'oiel painter Robert Bock. 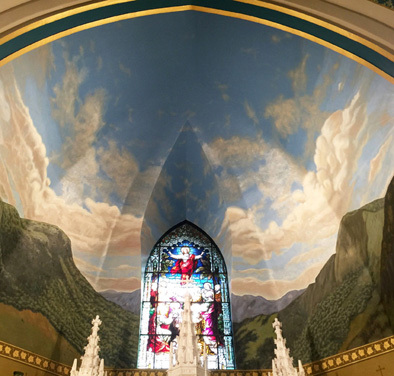 Kostecki's original work and restorations can be seen in churches throughout Central Massachusetts and upstate New York, including St. Paul's Church in West Warren, St. John's in Worcester, and the 30 x 40 feet nave mural depicted here, commissioned by St. Agnes Church in Lake placid, NY. In 2018, Geofrrey Kostecki was awarded a Mass Cultural Council Artist Fellowship in the Traditional Arts.